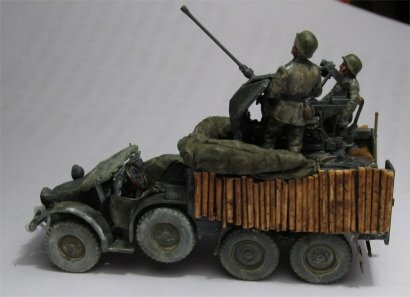 There is a good photographic evidence of Protze light trucks converted into mobile AA vehicles, either mounting a FlaK30 or a FlaK38. 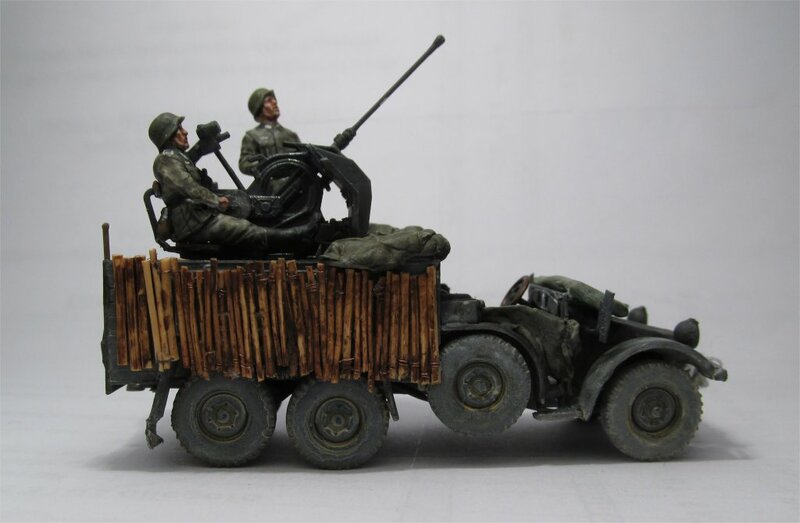 There is no official designation of the vehicle, since Kfz.81 originally defined the Protze carrying the FlaK gun and the same designation was carried on vehicles with the FlaK mounted on board. It was probably some kind of on-field modification, hence there was no standardization of gun mounting. In some photos, it seems that some sort of wood planks were mounted on the crew compartment, but the exact shape is unknown and probably different from one vehicle to another. I stumbled upon this photo and it caught my attention immediately because this vehicle looks so original that it might well be unique. First, there is some kind of log protection on the right side of the posterior compartment. In fact, we can not even know if it was really an additional protection (in this case, it was probably replicated on the left side) or if it was a corduroy bridge, used to improve traction on mud; many vehicles carried them, like the one in the foreground (in that case, it might be present on one side only). I went for the protection hypothesis, so I replicated it on both sides. Other details are more common. 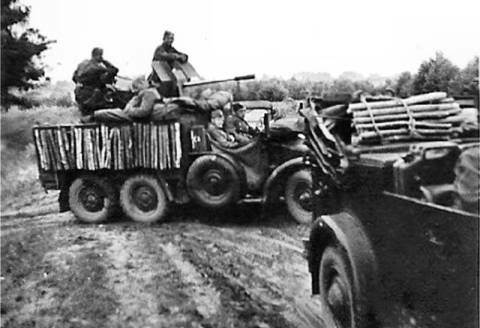 There is some kind of fabric protection covering the anterior doors, which was a rather common practice, there is a sausage-shaped structure in front of the gun, which might look like sandbags but it is probably a rolled tarpaulin (on which a soldier is leaning, sleeping), and the windscreen is horizontal and covered (again, another common practice). 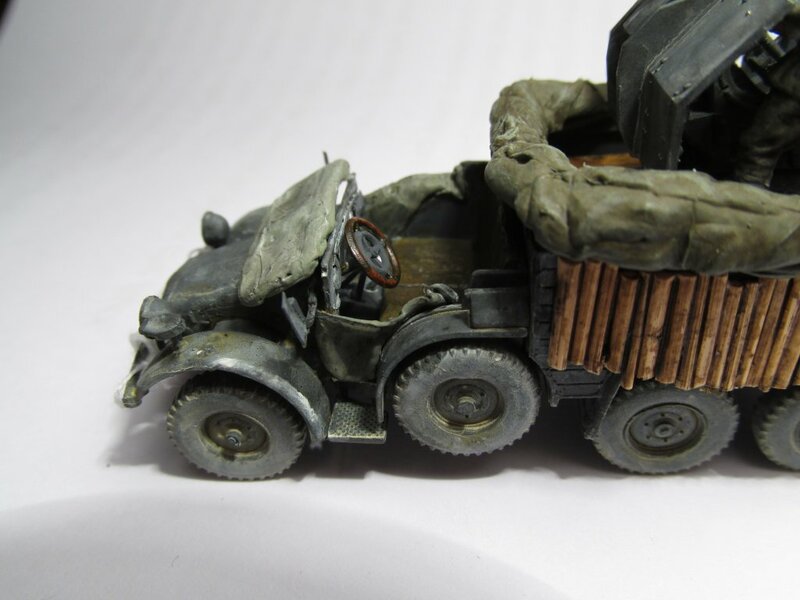 ICM produces two versions of Protze, the Kfz.69 (the one towing the Pak 36) and the Kfz.70 (used as a troop carrier), which is the one I used. Both version share the same frame, suspension and cab, and they only differ in the rear compartment. 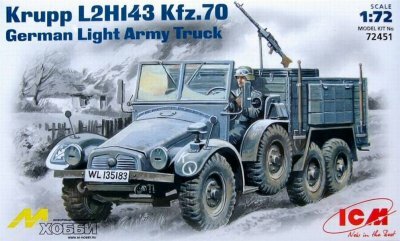 An in-depth review of the Kfz.69 version written by Al Magnus can be found here and every consideration can be applied to this version too. I bought my ICM Protze on Ebay, and was initially happy to find out that there were two kits in a box, not one as expected. Unfortunately, on closer inspection, I noticed that, in one kit, rear leaf springs (A21) and anterior hood were missing. 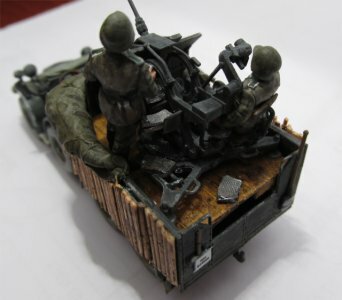 I made a resin copy of the three pieces and saved the kit, but it was not a good way to start the work on a kit that is not very easy to put together. ICM tried to reproduce the complexity and finesse of the frame, suspension and transmission in every detail, but forgot to provide strength and stability to the whole complex: therefore, you will find many thin and fragile pieces (some of which might easily break while being detached from the sprue) that are supposed to support firmly the six heavy wheels, but can not. In particular, the front steering and suspension unit (A13/A11) is too thin to support the front wheels, while the pieces supporting the posterior wheels (A8/A9) immediately broke during removal. I had to add small pieces of plastic and much glue to ensure a stable assembly. Assembling the rest of the kit was not so hard, if you can figure out what the instructions would want you to understand without them explaining it clearly. Although the kit is over-detailed in some sub-assemblies, such as suspension and transmission, many external and more visible particulars are missing, which is unjustifiable because their absence is much more evident than, say, that of some details of the transmission. For example, there are no rear view mirrors, yet their unique, characteristic structure is so typical of Protze. Luckily, they can be scratch-built easily, as I did. 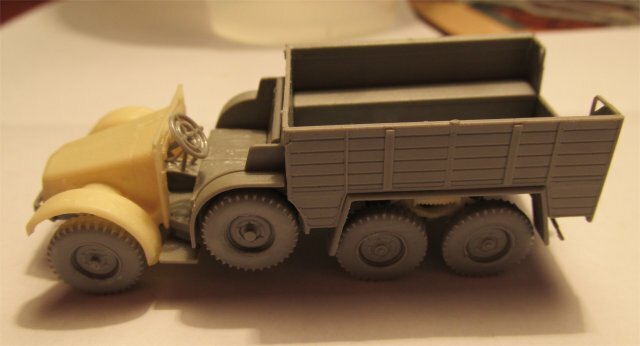 Other external details, such as flag frame on the left mudguard and width marker poles are absent too, but they probably broke easily since later photos show them rarely, yet they should have been added anyway to let the modeler decide whether to add them or not. The photo on the left clearly shows those details in a relatively undamaged Protze. Other missing details which should really be there are two flaps hanging from the posterior mudguards, dashboard, license plate and front towing hooks. All the missing details can be found in a dedicated photo-etched set produced by NH Detail (72-024). 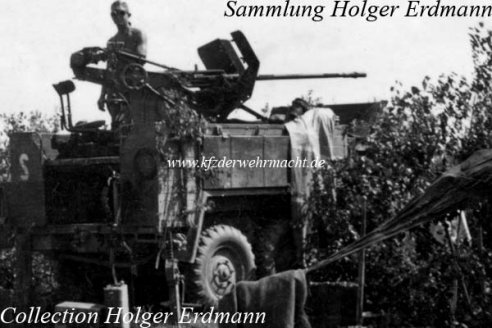 I could not find any "official" document describing the Protze with a mounted FlaK gun, hence we must assume that it was born "on the field", probably on the basis of the intuition of a Kfz.81 crew who, while towing a FlaK gun, had the idea of mounting it on the posterior compartment. Idea which they surely regretted, since their living space diminished considerably. Due to the extemporaneous of the modification, it is probable that the gun was mounted in a very simple way, over some kind of very basic wooden support. In this photo, it seems a wooden plank was used, covering the whole compartment by creating some sort of roof. To replicate this solution, I just cut a rectangle of thick plasticard, scribed some sort of wood pattern on it and glued it in place. The FlaK 38 by Zvezda is a snap-together, fast-built and wargame-oriented kit (11 pieces only! ), yet it nearly surpasses ACE and MAC ones in terms of detail and is unbeatable in terms of value for money, particularly when considering that you get two very nice bonus figures. 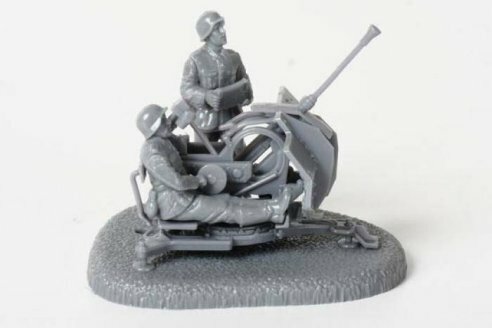 The recent one by Dragon is clearly superior but, as for now, is not sold as a stand-alone, but you must buy it with the Krupp Protze (you can find a review here). Naturally assembling the gun is a breeze, but some holes must be widened because their pegs do not fit. Thinning the shield is advisable, but being it rather fragile I decided to let it remain as it is. Unfortunately, you can not assemble the barrel at point-blank, which is stupid considering the many situations it was used to strike at ground targets. You can have the gun OOTB, but the barrel and muzzle are OOTW (out-of-this-world). The barrel is too short, the muzzle is too big so they spoil the typical outline of the gun. I substituted the barrel with an hypodermic needle and sculpted the muzzle from a droplet of Mr. Surfacer 500. 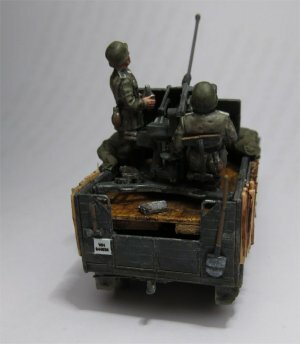 The three, small dish-like ground supports of the gun are sculpted on the base, so, if you do not want to mount the gun on the supplied base, you must remove them carefully or scratch them, which is not hard to do. Sadly, the kit does not contain any spare magazines or ammunition cases, which is a shame considering the many empty spaces on the sprues. The only magazines you can find are the one between the hands of the standing soldier and another one laying on the base. I made a copy of the last one with a small amount of white silicone and casted some resin copies. 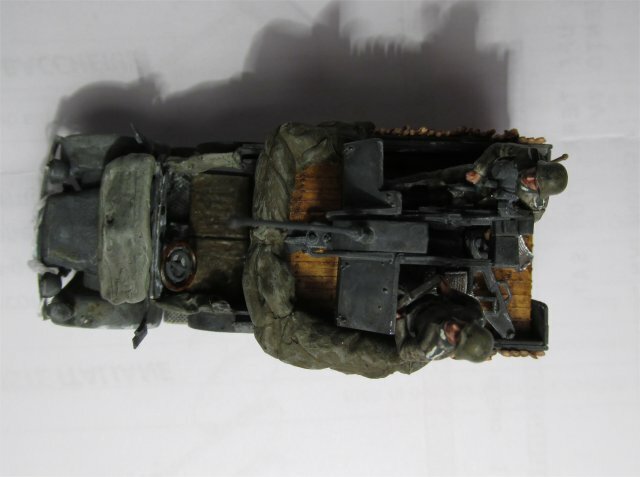 Funnily enough, Zvezda does not even provide the "active" magazine on the lateral slot of the barrel (is the firing crew aware of their actions or are they in a real hurry?). So, I put one of the copies in the slot and three more copies in the lateral, box-shaped structure on the barrel, which acted as a spare-magazine holder. Once the vehicle, the wooden plank and the FlaK38 are assembled together, the vehicle in se is finished. 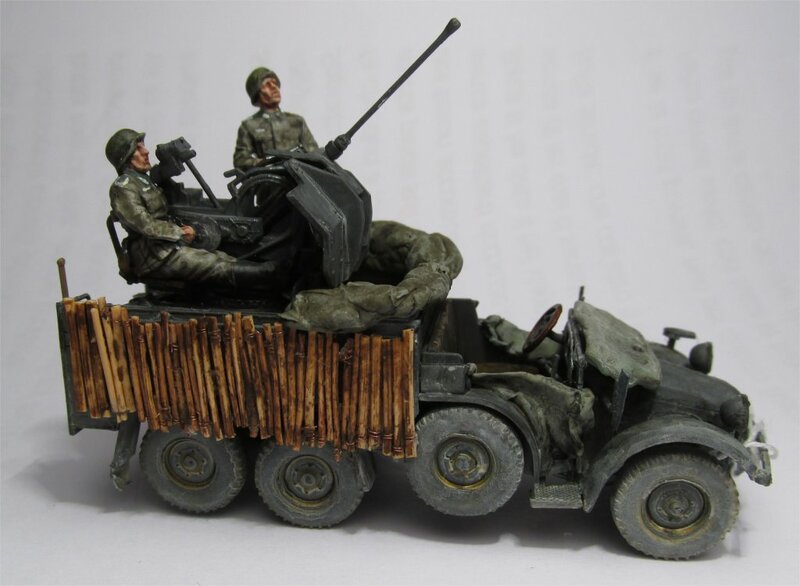 To make it look like the one in the photo, there are some details to scratchbuild: the rolled tarpaulin in front of the gun, the tissue covering the anterior doors and the protection for the windscreen were made with green stuff. The logs protecting the sides were made with sorghum from a broom, which took me some time to cut and assemble but it really looks the part, once painted and weathered. Painting is the usual German gray, weathered with many shades of lighter gray, plus a final coat of Lifecolor Dust. A brownish leather color for the seats, a blackish tone for the steering wheel, various shades of ochre and light brown for the wood parts and a shade of field grey for tissue. Figures were primed white, pre-shaded with a black wash and finally painted in field grey, with the collar and epaulets in dark green. 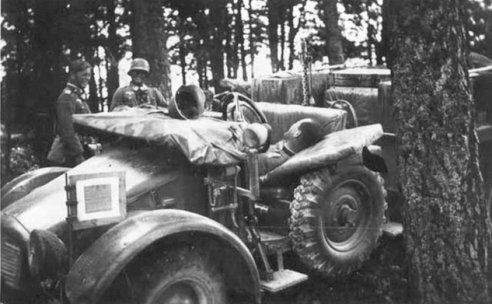 I could not figure out whether crew in these vehicle was from Wehrmacht or Luftwaffe: although some vehicles have a Luftwaffe license plate, I opted for a Wehrmacht vehicle supporting the infantry, hence a WH license plate and white waffenfarbe.